In the second interview for the Molecular Ecologist, we feature Dr. Ruth Shaw from the University of Minnesota (full disclosure, Dr. Shaw was my PhD adviser). Dr. Shaw is currently the Editor-in-Chief of the journal Evolution. In her research, she studies the evolutionary consequences of genetic variation using quantitative genetic approaches and has been active in the development of statistical approaches for the analysis of life history data. She has been recognized with the President’s Award from the American Society of Naturalists, the William Skinner Cooper Award from the Ecological Society of America, and the Outstanding Faculty Award from the University of Minnesota Council of Graduate Students. Below, we ask Dr. Shaw about her background, molecular research, and the journal Evolution in this tumultuous age of academic publishing. 1) Can you tell us a bit about how you got started in evolutionary ecology? I credit my parents with fostering my interest in the natural biota. Both were chemists, but they both knew plants and birds well and routinely consulted the field guides when they took the family on hikes near our home in Pennsylvania and elsewhere. So, though I considered other majors at Oberlin College, I gravitated toward biology, taking all the plant, micro, and math biology courses. In my final year, I took the vertebrate anatomy course, to see what all the pre-meds were complaining about. The professor, Warren Walker, made the subject thoroughly fascinating to me by taking an explicitly evolutionary perspective. That course sparked my interest in studying ongoing evolution of plants, and I was tremendously fortunate to have the opportunity to do my doctoral studies with Janis Antonovics, brilliant scientist, supportive advisor and great friend. 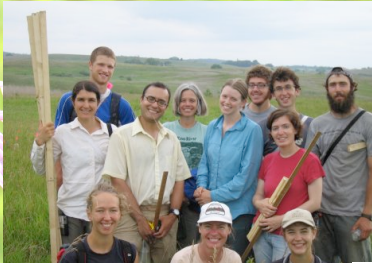 Dr. Ruth Shaw, in the middle wearing the green shirt, with part of the Echinacea Project (http://echinaceaproject.org/) field crew in western Minnesota. Photo courtesy of Stuart Wagenius. 2) Your work with Charlie Geyer on aster models was awarded the Presidential Award of the American Society of Naturalists as a major contribution to the study of selection in the wild. What do you think molecular ecologists could learn from this approach? Individual fitness and its distribution in populations are key properties on which population growth and adaptation depend, but the fact that fitness measures violate usual statistical assumptions compounds the considerable challenges of gathering data on fitness. We were motivated to develop aster to obtain a statistically sound, comprehensive approach to analyzing fitness. Now that we can use aster regularly in our analyses of fitness data, we are finding it highly informative. The utility of aster is certainly gratifying. An early application of aster was to compare backcross introgression lines with respect to fitness (Lowry, D. B. and J. H. Willis. 2010. A widespread chromosomal inversion polymorphism contributes to a major life-history transition, local adaptation, and reproductive isolation. PLoS Biol. 8: e1000500). It seems to me that many opportunities like this to evaluate the effects on fitness of variants in particular genomic regions would emerge from studies of NILs or other experimentally constructed populations. 3) You’ve offered some cautionary thoughts on the mapping the phenotype-to genotype program. What developments in molecular ecology and evolution do you think are likely to be the most illuminating in coming years? It’s clear that the evolutionarily and ecologically important process of dispersal, whether of individuals or pollen, is best evaluated with molecular approaches. I can imagine the use of molecular approaches jointly with quantitative genetic ones in efforts to address questions about the relative roles of gene flow and selection in the evolution of populations in various interesting ecological contexts, including biotic responses to climate change as well as range shifts. 4) As the new Editor-in-Chief at Evolution, can you describe your philosophy about the journal and its role in the field? I am greatly honored to serve as Editor-in-Chief of Evolution. The most stimulating papers I read as a graduate student were in Evolution. Papers from my dissertation and my postdoc appeared in Evolution, and I’ve valued it as a venue for my work and to find the important work of my colleagues ever since. Since its founding in 1947 as the first scientific journal focusing explicitly on evolution, Evolution has long had the mission of publishing “significant and original results that extend our understanding of evolutionary phenomena and processes.” I’m counting on the community of evolutionary biologists, in their roles producing and evaluating papers, to help me ensure that Evolution will continue to present important evolutionary research that inspires yet further incisive studies that advance understanding of evolution. 5) In a recent interview in Science Vitek Tracz, the founder of BioMed Central, questions the standard practice of anonymous peer review. What are your thoughts on this? Would Evolution consider publishing reviews as supplemental material with accepted articles? It seems to me that Tracz conflates two issues: that of whether reviewers of manuscripts should be granted anonymity with the issue of whether manuscripts should be reviewed at all before they are published. The question of whether reviewers’ names should be associated with their reviews, or alternatively, whether the review process should be double-blind, with names of authors, as well as reviewers, withheld while a manuscript is in review, seems to me worthy of discussion. Of course, some reviewers voluntarily disclose their identities. Regardless of that aspect, I consider the review process crucial to maintaining the validity of the scientific literature and the value of making scientific findings public. It is already difficult to find the most illuminating papers in the ever more rapidly burgeoning literature. That would become essentially impossible in the anarchy of publication without review. I should emphasize that, contrary to Tracz’s claims, I have found that most reviewers comment conscientiously and constructively and submit their reviews in a timely way. There are certainly egregious exceptions, but they are exceptions. As an author, though I have very rarely received an unfair or very delayed review, much more often, I am grateful to reviewers for helping me making my papers clearer. 6) You’ve worked on large field experiments, developed statistical methods, have many great collaborators and have been awarded for your graduate advising. What advice do you have for young academics on balancing all this? Balancing many commitments is a great challenge for everyone, and my guess is that this is true in many walks of life beyond academia. There are always many more stimulating, enticing projects than one can take on and do well. I know that quality suffers as overload becomes extreme; this makes me think carefully before committing to a new project or agreeing to a request. It’s helpful to have mentors and colleagues who recognize the importance of keeping commitments to a manageable level, not just early on, but career-long, and I have been fortunate in this way. I get a great deal of satisfaction and energy from the activities you’ve listed. Many are the days that I’ve headed home fully energized after a dynamic discussion with one or several graduate students or an insightful faculty colleague. This entry was posted in interview, peer review and tagged Ruth Shaw. Bookmark the permalink.